Copyright © 1991, 1993, 2015 Timothy S. Klugh. All Rights Reserved. Copyright © 1991, 2015 Timothy S. Klugh. All Rights Reserved. 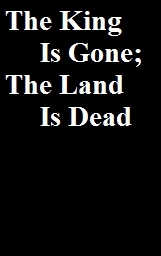 "The King Is Gone; The Land Is Dead"
Album originally recorded in 1991 at T.S. Klugh Studio.